Visit Universal Studios Japan on an exciting overnight trip from Tokyo, complete with a round-trip bullet train ticket and Osaka hotel accommodation! The theme park has something for all the family, from movie magic at The Wizarding World of Harry Potter to pulse-pumping rides in the ‘Jurassic Park’ zone. Meet beloved characters like Hello Kitty, and discover the park at your own pace; it’s a great way to visit one of Japan’s top theme parks with no worries about logistics. Make your own way to Tokyo Station in the early morning and board your super-fast bullet train (Shinkansen) on your own. With a Hikari Shinkansen ticket, settle in to your reserved seat and relax on the 3-hour ride to Shin-Osaka. On arrival, catch another train to JR Universal City Station, and walk the short distance to Universal Studios Japan, less than five minutes away. Luggage lockers are located just outside the park, which you can use at your own expense, if needed. With your ticket in hand, head straight inside and let the fun begin! 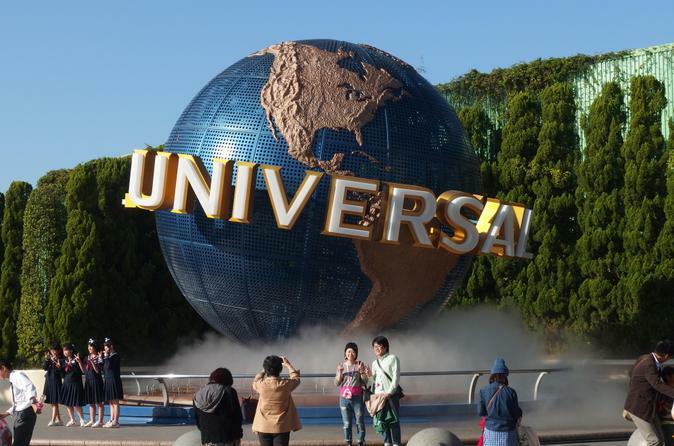 As one of Japan's largest theme parks, Universal Studios Japan has something for all the family. The park is split into different zones - ranging from real-life areas to make-believe places of fantasy — with a separate Universal Wonderland for little ones, too. Check out thrilling rides such as Harry Potter and the Forbidden Journey, based on your favorite blockbuster hits, and discover calm carousels, simulators, white-knuckle roller coasters and more. See the Itinerary for a list of attractions. In between looping-the-loops on the park’s countless rides, take a break and watch one of the shows. Performances change frequently, but you can expect to see dancing and processions by much-loved character mascots such as Hello Kitty. There’s also a large selection of continental restaurants to keep hunger at bay. Food and drinks are at your own expense. When you’ve had your fill of theme park fun, return to central Osaka, check in to your hotel and spend your evening at leisure. In the morning, make your own way to Shin-Osaka station to catch your bullet train back to Tokyo. Your experience finishes at Tokyo Station in the afternoon.